The men’s basketball team from Grace College, Winona Lake, Indiana, along with the Warsaw(IN) Morning Optimist Club and Warsaw’s Holiday Inn Express, will join forces with the Kosciusko County Cancer Care Fund (KCCCF) this weekend in the Hoops for Hope Basketball Tourney on December 8 and 9. The purpose of the tourney is to generate funds for cancer research in Indiana and assistance for local families of the Warsaw/Winona Lake community who are in financial need due to their personal battles with cancer. Men’s basketball coach Jim Kessler says, “With the existing level of interest in basketball in this community and on the Grace campus, such a tournament is a fantastic vehicle to generate awareness of the need and at the same time produce assistance to make a difference for folks in our community. “Our plan is to donate the entire gate to the KCCCF. As a result we are asking everyone who attends to make a $5 donation as an entrance fee which is good for one or both sessions. Friday, December 8, 6 p.m. – Cornerstone vs. Missouri Baptist. 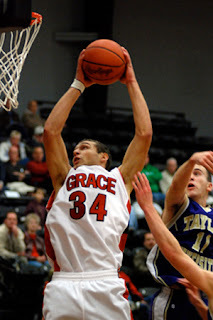 To keep up with Lancer basketball this season, go to http://www.grace.edu/athletics/.